The basic purpose of all articles is to make readers aware of the planets, stars and constellations that can be seen with our naked eyes. When we look up at the deep dark sky at any random nights we should get amazed and inspired. We are always engrossed in our own emotional and psychological traps that we have almost forgotten that we are a mere creature in this vast universe who don’t even know the purpose of life. When we look at sky we must tell ourselves that our existence in this vast universe is even less than a dust particle. So whenever you feel low just get to some dark area out of the city and look UP in the sky at nights. Gratitude should be part of our everyday life. Families should get out of cities and get amazed. We should create such trends, such culture in our society. We just have celebrated the grand, great festival of lights. Diwali symbolizes the victory of good over evil, light over darkness, good over bad. And to celebrate it we use firework. The sparkles of firework not only entertain us but also make us feel good by the special effects when they burst little above the ground in the sky at nights. They seem like stars falling down! Isn’t it? What if we get to see star falling from sky at night? Would such sight fascinate you? I guess YES! And that’s what exactly is going to happen in coming days and months. And we will be seeing not only one or two stars falling down from the sky. We will get to see hundreds of stars falling down from the DEEP DARK sky. Let’s learn more about the fireworks from heavens above. Even today, these modern days of science and technology, these shootings stars have always been a great subject of enthusiasm and great mysteries around the world. Many poets, artists, authors, novelists got impressed by such celestial phenomena already. Even commoners, when get to see even a single shooting star in the sky, they get stunned and excited at the sight of such striking light coming down towards earth in fraction of seconds. Today we will see some interesting facts and myths about shooting stars. In the time of Mahabharata, in a conversation between Yudhishtir and Bhim, we find mentions of meteor shower and meteorites. Another mentions of such shower occurs at the battlefield when Pandava’s fight Ashwathama. Maharshi Vedvyas, who also authored Shivpuran, writes about meteor shower and meteorites falling down on the earth and destroying human habitat. When meteorites fall, they hit the earth surface with great force. Such meteorites can cause tremendous damage to the living beings on planet earth. LONAR lake has been formed by one such big meteorite. Even dinosaurs’ extinction is also considered to have happened because of huge meteorites hitting earth very hard. In the year 2014, a fearsome meteor shower shook the world. This meteor shower, threw thousands of meteorites on the earth. The area which was being hit is in Russia. Thousands of people got injured due to this shower. How disastrous this is! The mentions of meteorites in Mahabharata narrate same kind of disasters on earth. Our ancestors knew what meteorites were and what meteor shower was! There is a very common belief which originated from the European/Greek cultures about making a wish upon a falling star. The belief goes like this, if you could make a wish upon such a shooting star, that wish is granted by the gods in the heaven above. Greek philosopher and astrologist, Ptolemy puts a theory of why such wishes can be granted by Gods. According to him, when Gods peer down with earth from heaven, they create a special channel or path to look upon earth. If some star comes in this path, it cut loses from the heaven and fall down towards earth. So seeing such shooting star symbolises that the Gods are now connected with earth. Gods are listening to human beings on earth. And that’s exactly, at the time only, if one could make a wish, the wish would be granted as Gods are more attentive that time. Well, this is just a myth. And no such granting happens in real world. Let’s try to understand what is a shooting star.There are many other objects flying freely in the space. These objects sometimes may be comets of the dust or small rocks left over by a passing comet. Such comets are free objects. They sometime are not part of solar system. They can span two or sometimes more solar systems. They keep on flying in their own orbit in the space. Whenever they go pass our solar system, the dust or the small rocks in the tail of comets, get attracted towards members of our solar system. Some are getting attracted towards our very own planet, the Earth. As they come in to the gravitational influence of earth, they cut lose from comet and start their journey towards earth. Such dust particles, small rocks, big rocks are called as meteorites. The streak of light in this remarkable photograph below is a “shooting star,” a tiny speck of space debris burning up as it enters Earth’s atmosphere. To the naked eye, a shooting star appears as a fleeting flash of white light. This image, however, documents the appearance of a wide spectrum of colors produced by the object as it hurdles toward Earth. These colors are predictable: first red, then white, and finally blue. If the meteor (shooting star) is large enough to survive the fall through the atmosphere, it cools and doesn’t emit any visible light at all. The colors of this shooting star may also indicate the minerals that make up the space rock. Different elements emit different-colored light when they burn. Iron, one of the most common elements found in meteors, glows yellow. Silicates, which contain a form of the element silicon, glow red. 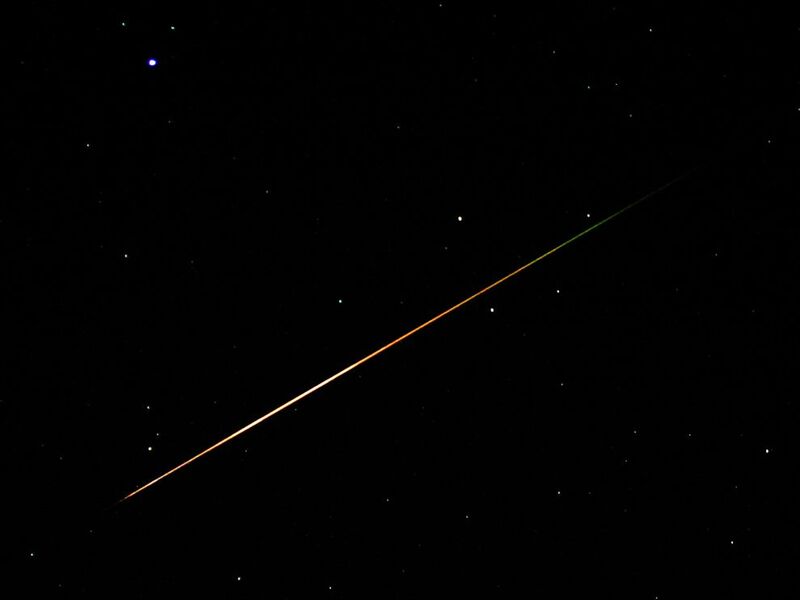 A green glow, clearly visible in the trail of this shooting star, indicates the presence of burning copper. We can also see fireballs in meteor shower. Fireballs are the meteors made of comparatively large meteorites. 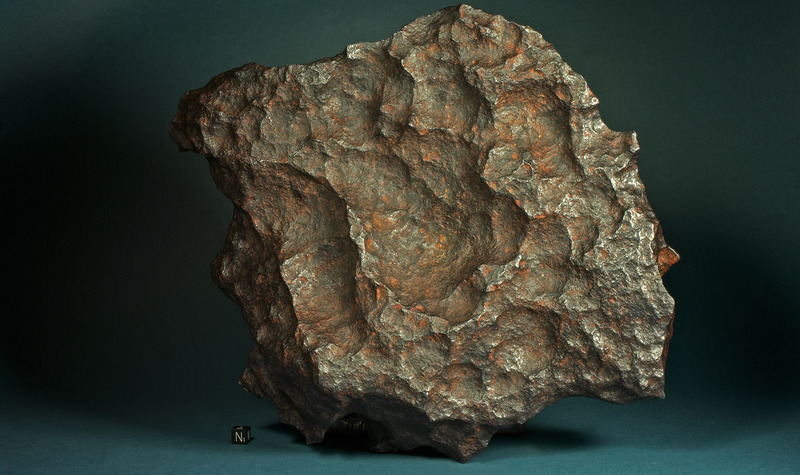 Such large meteorites sometimes survive the atmospheric friction and seem like falling very close to us, may be a hundred feet above the ground. When these fireballs burn out they make a wonderful spectacle with varied colours. These colours are visible to naked eyes also. What all do you need to watch meteors and meteor shower? Absolutely nothing you need to witness such a wonderful sky show. We can see meteor shower wiz shooting stars with our naked eyes. Special care must be taken when you are going out of cities to watch meteor shower such as you need dark places. You would some mats and something to eat while you are all awake during the nights. An arrangement of hot cup of tea, in cold night would be a great luxury. Don’t forget to carry woollen cloths, caps to protect yourself from cold nights. When to see meteor shower? So mark your calendars for this wonderful firework sky show. Hope you liked reading this article. Do share with your friends and family. ohh i see now. These are not stars ! !